Fall provides ample opportunities to make your home look more cozy and inviting from the outside, which will increase the buyer traffic if your home is on the market. If you have deciduous trees, you're already ahead of the game when it comes to "decorating" your property, but there are several other things you can do to kick up the welcoming factor a notch and get your home noticed. - Rake the leaves. This is not just a neat-freak maintenance suggestion; raking up your leaves is good for your lawn. It allows it to "breathe," prevents snow mold in the winter, and gives your grass ample sunlight. - Clear out all summer annuals and condition the soil. Also add another layer of mulch to keep the soil at an even temperature. - If your yard lacks mature trees and shrubs, fall is the best time to plant. They take root and start getting used to the cooler climate. - If you're thinking of waiting until Spring to put your house on the market, right now is the best time to get those spring bulbs in the ground. - Hang a fall wreath on your front door and you'll add an extra welcoming element as someone enters your home. If you're a little on the crafty side, this Addicted to Decorating Web site has 30 DIY ideas for making your own wreath. - There are also many other ways to add natural elements to your front entry with a large variety of leaves, gourds, and plants. Click through these great ideas from Better Homes & Gardens. - Marigolds - These easy-to-grow annuals come in gold, copper, and brass, which are the perfect compliments to fall. - Mums (Chrysanthemums) - With around 40 species, these colorful flowers have annual and perennial varieties, and they grow well in the ground or in containers. - Pansies - Perfect for containers, borders, or ground cover, these colorful annuals are extra hardy. - Asters - Daisy-like in appearance, these perennials bring an extra punch of color and style to fall's more traditional flowers. - Hydrangeas - These ornamental beauties come in a variety of colors and are a favorite for fall arrangements. - Juniper - There are several varieties of juniper, but the evergreen ground cover is very hardy, and it changes from blueish-green to purple in the winter. - Wandering Jew - A staple in the south for flower beds and baskets, this purple-leaf plant is low maintenance and multiplies quickly. - Dusty Miller - The silvery foliage of this low-maintenance perennial will add a beautiful contrast to other plants in the ground or in planters. Give people a reason to do a double-take when they see your home! 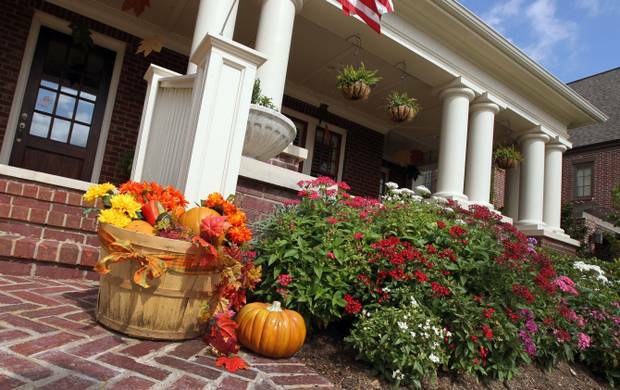 Listing your home in the Fall is not a bad idea. Folks seem to be moving to Nashville year round. If you are considering selling this Spring maybe the Fall is right time for you? Less competition and the home decor can be warm comforting to a Buyer. .... "You've Got a Friend in Real Estate"